The University of Minnesota Duluth Men’s hockey team made their 2017-18 season debut Saturday night in a thrilling exhibition game against the Alberta Golden Bears. 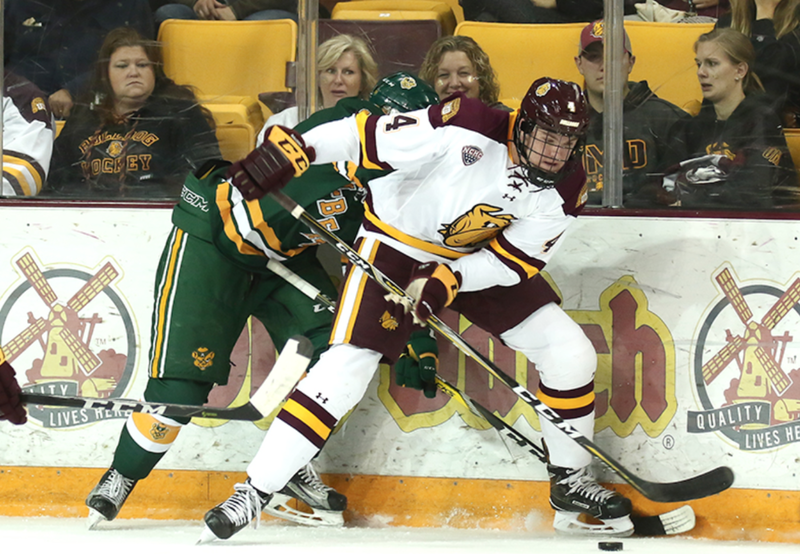 It was a battle of special teams at Amsoil Arena as the Bulldogs and Golden Bears racked up a combined total of 60 penalty minutes. Despite leading in shots on goal, the Bulldogs ultimately fell short with a final score of 4-3. Bulldog freshman Dylan Samberg scored the first goal of the season just 52 seconds into the game, with the Golden Bears scoring an equalizer six minutes later, ultimately ending the first period in a 1-1 draw. As the special teams battle continued into the second period, both Riley Tufte and Scott Perunovich capitalized on power plays bringing the Bulldogs ahead once again with a score of 3-1. The Bulldogs later lost their two-goal lead in the third period with the Golden Bears netting back-to-back goals 50 seconds apart. The final blow of the game came just three minutes later, with Graeme Craig capitalizing on a power play opportunity and propelling the Golden Bears to their 4-3 lead. Each of UMD’s young goaltenders saw one period of play, with sophomore Nick Deery starting the game and allowing one goal in seven shots. Sophomore goaltender Hunter Shepard followed, stopping all ten shots he faced. The youngest goaltender, freshman Ben Patt ended the last 20 minutes of regulation, letting in three of the total twelve shots fired his way. With eleven new skaters on the team, UMD walked away from the exhibition game loss having gained experience together as a fresh unit. The UMD Bulldogs will kick off their regulation season next Friday, Oct. 6 at Amsoil Arena against the University of Minnesota.